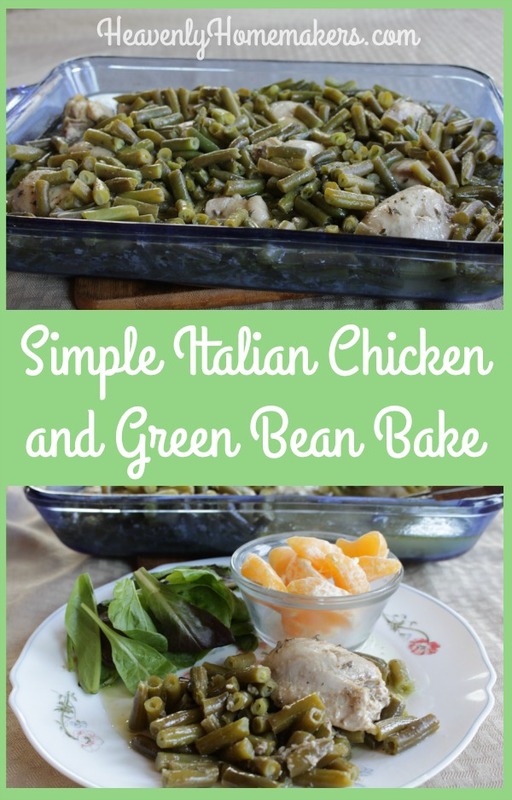 I am so thankful for how this Simple Italian Chicken Bake practically makes itself and feeds my family so easily! Here’s what was going down in my house: Matt was working across town. Justus had just left for his college class. Elias was upstairs reading his English assignment. Malachi was practicing his piano. I was finally sitting down at my computer to write posts, answer emails, and edit pictures. This is when my stomach growled. You’d think lunch wouldn’t have slipped my mind, seeing as I’ve been eating this meal every day for the past 43 years. But there it was, 11:30. There was no lunch and there were no leftovers to fall back on. I got up and put chicken and green beans in a dish, doused it with Italian dressing, and put it in the oven. Five minutes later, I was back at my computer writing. While our meal baked, we all got work done (work that did not involve being in the kitchen). An hour later, we were eating lunch. If this meal doesn’t define “simple” I don’t know what does. Lay chicken in a 9x13 baking dish. 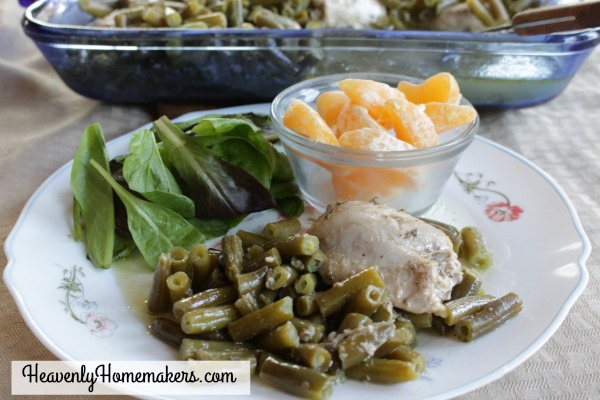 Pour green beans over the chicken. Pour Italian dressing over the beans and chicken. Cover and bake in a 400 degree oven for 45 minutes to 1 hour or until chicken is no longer pink. *Here’s my Italian Dressing recipe. I try to always have some on hand for quick meals and salads. The baking time on this recipe varies depending on your oven and the thickness of your chicken pieces. If you want this meal to be ready to serve in a shorter amount of time, cut your chicken into small, thin pieces. You will love how easy and flavorful this meal is! It’s recipes like this that makes Simple Meals such a life saver for families. We’ll provide the plans. We’ll provide the recipes. We’ll provide the grocery list. All you have to do is take a deep breath and enjoy how simple your life in the kitchen has become! Join Simple Meals! Was this frozen chicken or fresh? Fresh. If you did frozen, just double the baking time and that would probably work (though I haven’t tried it! ).